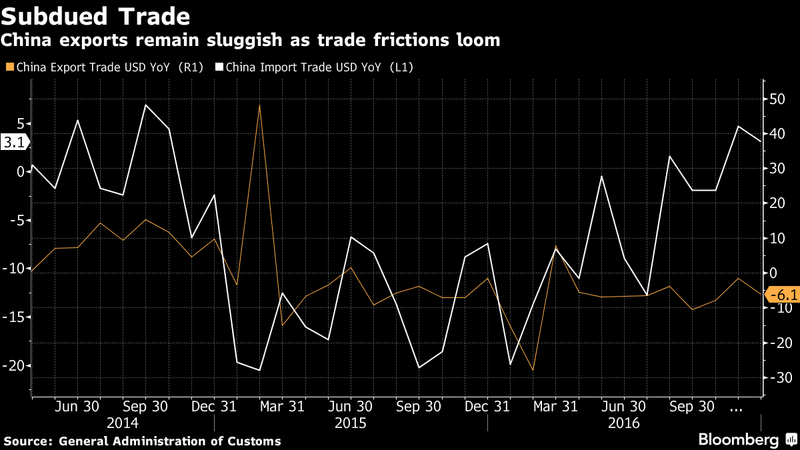 China’s exports remained subdued as soft global demand weighed on sales, raising uncertainties for the nation’s external sector as it braces for potential trade frictions with the U.S. under a Donald Trump presidency. Overseas shipments dropped 6.1 percent from a year earlier in December, the customs administration said Friday. Imports rose 3.1 percent, leaving a $40.8 billion trade surplus. “External demand remains sluggish,” said Wen Bin, a researcher at China Minsheng Banking Corp. in Beijing. “The outlook for exports this year doesn’t look very promising,” he said, citing slowing global trade amid rising protectionism and uncertainties in U.S. trade policy. The weakening yuan, which fell 6.5 percent against the dollar last year and depreciated 6 percent against a basket of currencies, is cushioning the impact of tepid global demand but doing little to revive sales. The world’s largest exporter faces more challenges and uncertainties this year as Trump — who accused China of being a trade cheat through his campaign — is due to take office in a week. The trade surplus, which represents demand borrowed from the rest of the world, decreased for the first time since 2011. It fell to $512.9 billion from a record $593.9 billion in 2015. China will closely monitor U.S. trade policy after Trump’s inauguration, Customs spokesman Huang Songping said at a briefing in Beijing, citing global trends toward populist policies. Trade still faces large uncertainties this year amid a complicated global context and downward pressure on the economy is “still big,” Huang said. Higher costs reduce trade advantages and market share is being lost to Southeast Asian nations, he said. Exports in yuan terms rose 0.6 percent in December while imports posted a second-straight 10.8 percent gain. For the full year, exports fell 2 percent in yuan terms while imports rose 0.6 percent, the customs administration said. Exports to the U.S., China’s largest trading partner, rose 5.1 percent for a second straight increase while shipments to the European Union resumed declines, falling 4.7 percent. Exports to South Korea climbed 8.3 percent for the first increase since March. Iron ore imports by China surged to a record above 1 billion metric tons last year as unexpectedly strong steel production and lower local mine output combined to fire up demand in the world’s top buyer for cargoes from Australia and Brazil, supporting a rebound in prices.